Tuesday, November 20 at the Fry Funeral Home in Tipton, Iowa with a visitation beginning at 9:30 am. Wabash Transformer in Tipton. 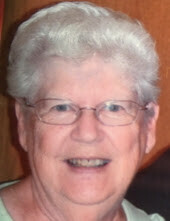 She enjoyed quilting, genealogy, and Riverboat gambling with Forry. Willer, Kim (Greg) Wilson and five great-grandchildren. Memorials may be directed to the Tipton Senior Center or the Tipton United Methodist Church.